Memories are wild and free. Imagine for a second how you would like to be remembered. Who would do the commemorating? Your friends perhaps, family, maybe a spouse or lover? Would they remember you, the person, or a special event you shared like a marriage proposal, the birth of a child, a personal triumph? Who did you leave behind? Somebody you grew old with or shared a passionate romance, an unfulfilled love, perhaps a beloved animal companion? Join me on a little walk. We get clues and hints of the lives of others as we wander through Central Park. 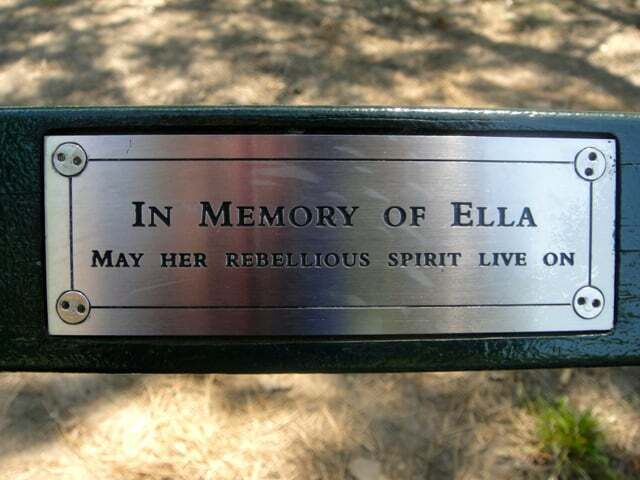 They are written in short messages on small metal plaques affixed to the top rails of some of the park benches. Clues written with humor and great affection, sometimes bittersweet, sometimes sassy. “Remembering our happy days, watching the dogs” dedicates Judy to her Stephan on a bench under a magnificent old Sycamore tree. Her message conjures up pictures of good days spend on a sunny spot, feeding the ducks, children’s laughter, little league games. There are also many stories of death and loss, after all our city has seen hard times. Out of the 9,000 park benches almost half carry memorial plaques. 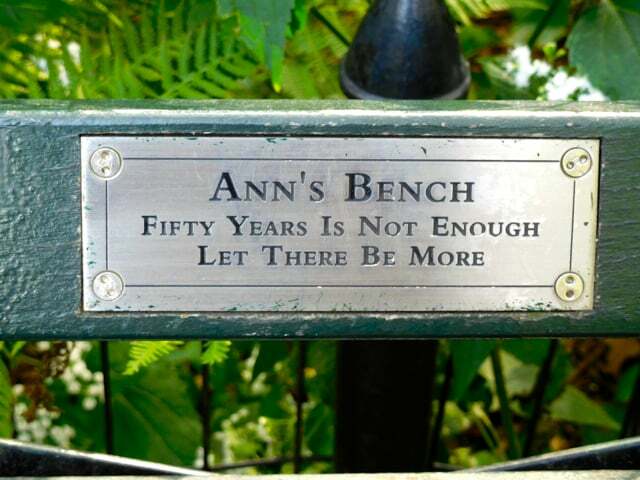 The Adopt-a Bench project is overseen by the non profit Central Park Women’s Committee as a way of maintaining the park. 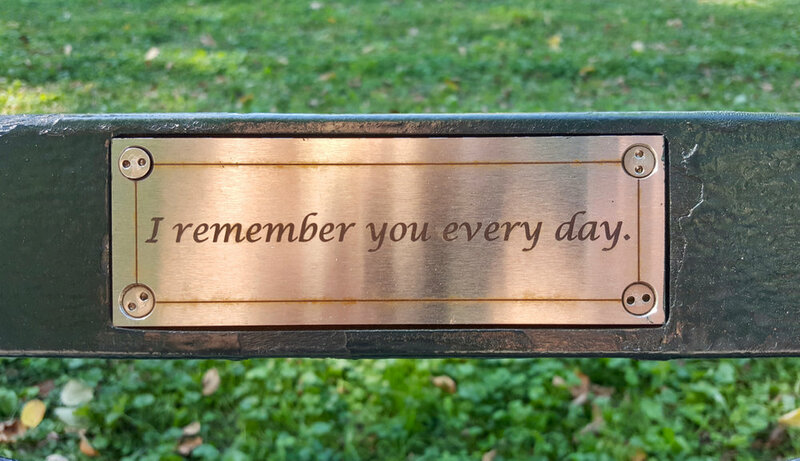 A hefty contribution of $10.000 by check, credit card or stock transfer will get you 120 characters engraved on a small metal plate installed on a bench of your choosing, based on availability. 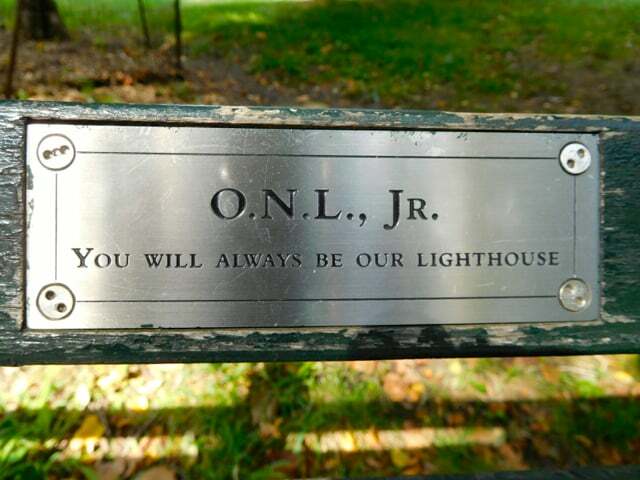 Benches have been dedicated to the dead as well as the living, given as business gifts, for High School graduation or to celebrate retirement. However, without a doubt the favorites are the hopelessly romantic. “L.H. 1912-2006 + M.H. 1912-2010 Married Valentine’s Day 1935. A dearer couple there was not. Their spirit surrounds this special spot”. Some won’t let us forget the original heroes of New York : “The Hansen Sisters Served oversees in WWII, with the American Red Cross. One in Europe the other on in the Pacific.”; another one honors the loyalty and duty of the rescue dogs of 9/11. 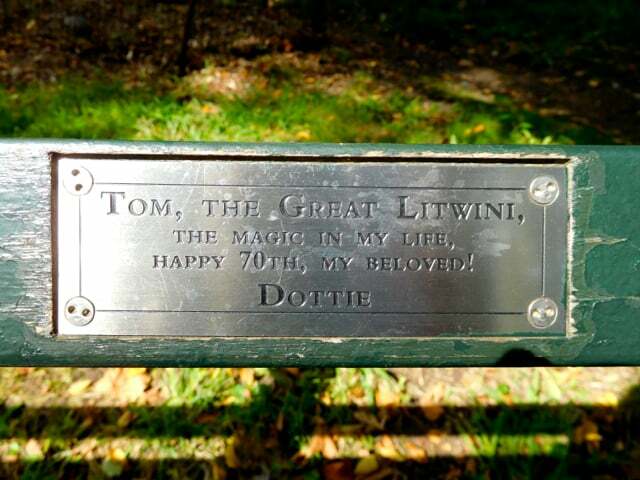 As it is written on the bench dedicated by former Major Ed Koch, “Come sit with me here and enjoy the pleasures of the Great Lawn”. Life happens all around you here on these benches. Jittery first dates, stolen kisses, lunch meetings, books being devoured, toddlers being bounced on knees, dogs playing fetch in mottled sunlight. A stranger’s name on a plaque can become like an old friend, a real person you are glad to see again. Well then, all you poets and lovers, you can leave your own mark on the city or go and visit those who have come before. Seasons turn, leaves change but they benches will be here year after year. "Tempus fugit, amor manet" says Virgil, Time flies but Love remains. In some places it lingers a little longer.